This website contains only general information about bankruptcy. The information contained on this website is intended, but not promised, to be correct, complete, or up-to-date. This website was created to try to “breath life” into the dry...but hugely important...bankruptcy laws, to give you a general overview of how the bankruptcy laws work, to illustrate results that have and can be achieved...in appropriate cases...by filing bankruptcy, to give you hope that filing bankruptcy...where necessary and appropriate, may dramatically improve your financial situation and, hopefully, the day-to-day quality of your life, and to do so in a manner that is...we hope...more interesting than watching paint dry. However, nothing contained on this website is meant to provide you with legal advice regarding your particular situation, nor is the information intended to create any sort of attorney/client relationship. Bankruptcy law is complicated and any attempt to apply any of the information contained on this website to your particular situation, without the help and advice of an experienced bankruptcy attorney, may well do more harm than good. Furthermore, promising as some of the information may seem, nothing on this website is intended to serve as a substitute for a full and complete assessment of your own, particular situation by a experienced and knowledgeable bankruptcy attorney. Bankruptcy is not for everyone. A decision to file bankruptcy should only be made after consulting with an experienced and knowledgeable bankruptcy attorney about your particular facts and circumstances and, then, only after a complete evaluation and discussion about all the consequences and competing considerations. The owner of this website makes no representation as to the results to be achieved in your particular situation, since the results to be achieved will depend on the advisability of filing bankruptcy and will vary depending upon the chapter under which you file, the State where you live, and your particular goals, assets, debts, income and expenses. Everything on this website is intended to be truthful and accurate, in every regard. Nothing is intended to mislead you or anyone else. However, with so much material written and presented, even the best of intentions, we will not have caught all errors in grammar, context, spelling, etc., nor will we have envisioned all possible interpretations of the material presented, some of which might well give rise to ethical or legal concerns. You should not make any decisions or draw any hard and fast conclusions about the effect of filing bankruptcy based solely upon information presented. Metaphors, analogies, slang, turns of phrase, idioms and other literary devices utilized on this website are NOT meant to be read literally. The use of these literary devices is merely our attempt to relate to you...however imperfectly...a complicated and complex set of laws in a simple and more easily understood fashion. Having taken into full account this and other disclaimers included on this website, you still feel that something on this website: (1) Constitutes a material misrepresentation of fact or law, or omits a fact necessary to make any statement, considered as a whole, not materially misleading, or (2) Is likely to create an unjustified expectation about results we, as North Carolina lawyers, can achieve, or states or implies results that we, as lawyers, can only achieve by means that violate the Rules of Professional Conduct or other law, or (3) Compares our services with the services of other lawyers in a way that cannot be factually substantiated, please let us know. 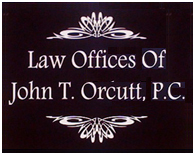 Please address your feedback, complaints and concerns to us by email addressed to attorney John Orcutt himself. You can get his email by calling 1-888-234-4181. (We do not list an email here solely for the purpose of avoiding the generation of unwanted internet spam.) We will promptly, if not immediately, address all issues that you raise and will immediately take any and all steps necessary and appropriate to correct any errors as may exist. Videos Presented On This Website: This website contains copies of various ads created for purposes of advertising on TV. 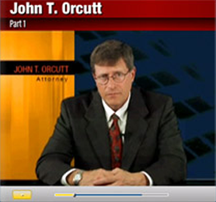 Many of these ads contain people, other than attorney John Orcutt himself. With one exception, all of these particular ads contain dramatizations and do not depict actual events or real persons. That is, these people are actors, not clients, hired to help produce the ads. The one exception is the ad entitled "It worked for me. It could work for you."